"Most mathematicians did not just take up math as a "job"...(most) get more pleasure out of mathematics than almost any other activity. And they often discovered this pleasure when they were young..."
While most people would agree that "math people" are not like "non-math people", it's not always easy for non-mathematical minds to recognize (and appropriately nurture) mathematical ones. The reasons for this are several - mathematical kids are often independent and internally-driven problem solvers who may or may not excel in the standard math tasks of the elementary school classroom (if he's such a math kid, how come he's getting C's on his timed drills?...) Many students with extreme talents in math may also be relatively verbal-poor, so are less obviously the "smart" children in class. Also they may be reluctant to show what they know or what they are interested in to relative strangers, and may have difficulty explaining how they arrived at answers. Many mathematical minds are dyslexic or twice exceptional in another areas, too, complicating their identification with standardized tests or screening tools. Numbers Kids The numbers kids are perhaps the easiest to recognize - and they often come from families where one or both parents have a special affinity to mathematics (engineers, computer science, academics). It may start out with children interested in patterns and facts within mathematics (divisibility rules, cube roots, etc. ), card and other games, recreational math topics (Fibonacci sequence, fractals, probability, solving problems for 'fun') or mathematics in the world of adults (e.g. Philip Davis' cousin who let him be bookkeeper at the age of 7, keeping track of a race horse's handicap and winnings). Tinkering Kids Tinkering kids tend to enjoy conceptual science books, building and unbuilding (gears, taking apart ball point pens and toys, clocks, cameras, origami etc. ), computer-related activities, projects (completed and incomplete), and beautiful and unbeautiful design. By temperament, strong math minds will tend to be introverted and have high focus and task persistence for activities of intrinsic interest. This may mean they are difficult to direct in the traditional or even non-traditional classroom (prefer studying lines of own interest), and they may be benefited particularly by mentors (often relatives or math teachers at higher levels of education) willing to discuss topics, ideas, and problems far in advance of their years. Silverman and Feldman have distinguished engineering / math-gifted individuals into sensor (likes facts, data, experimentation) and intuitor (prefers principles and theories) groups. Both were capable of becoming "fine engineers", but sensors with less direct success in traditional academics. Recently, some investigators have begun to look at brain-related differences in mathematically-gifted students (to our knowledge this has not been done in professional mathematicians, engineers, physicists); in his study of mathematically-gifted adolescents, Michael O'Boyle has found that superior mathematics performance was correlated with increased bihemispheric activation (vs. unilateral activation) for mathematics tasks, enhanced involvement of the right hemisphere for information (including linguistic) processing, and strong prefrontal cortex activation. 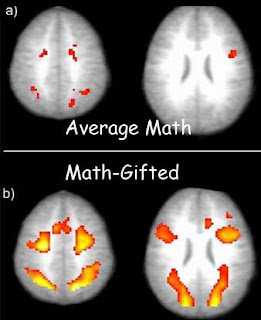 As seen in the figure above, math-gifted adolescents performing mental rotation tasks activate much more brain bilaterally than average math-performing peers. The optimal educational pathways for young math thinkers may also vary widely. Some thrive with subject acceleration, while others plenty of free time to explore topics of personal interest - whether conceptual or technical.
" I loved doing problems in school. I'd take them home and make up new ones of my own. But the best problem I ever found, I found in my local public library. I was just browsing through the section of math books and I found this one book, which was all about one particular problem—Fermat's Last Theorem. This problem had been unsolved by mathematicians for 300 years. It looked so simple, and yet all the great mathematicians in history couldn't solve it. Here was a problem, that I, a ten year old, could understand and I knew from that moment that I would never let it go. I had to solve it." This is an extremely interesting bit on mathematics. I have a 13-year-old son who is very advanced in math. I plan to have him watch the video on Fermat's Last Theorem. I will also pass this information on to my clients. Thank you very much for the wonderful information!! Fascinating! After twenty years of teaching elementary and middle school math, I can spot these kids with increasing frequency. Now, if I could just diplomatically communicate this difference. I need some adivice for myself. I was very good at math in school, but not very good with words. I liked solving complex and abstract mathematical problems, but was not good at quick mental math. I excelled at higher math (e.g. calculus etc) and physics in high school, and scored in the 98th percentile in a standardized physics test when I was sixteen. I did not recognize this talent back then and thought that I was good in all the sciences. Therefore, I chose to study biology in college. This turned out to be a bad decision as I barely survived my courses initially, but later with a lot of effort I have gained some competence in the subject and the way of thinking and learning required for it. Do you think that my mathematical ability is innate? While I might need to brush up on some material, would I be better off chosing a career with use of the mathematical ability. Also,I am more like the person described in the very first paragraph of your blog i.e. reserved etc. P.S. I am currently looking for a medical career. Hi there, interesting questions you raise. If possible, choose something that you like to do...although often what one does well is something that they like to do. If you are looking for a medical career - I would think that some of the radiographic disciplines would combine mathematical and expertise with science. Based on what you've written, I'm not sure if you were thinking of medicine / medical school - but within these disciplines, radiation oncology, interventional radiology come to mind. If you have time to dabble, perhaps you could browse webpage of university faculty - see what sorts of research they do - and what gets you interested. If you end up being more interested in the mathematical / physics side - then biomedical engineering might also be a possibility I would think. It is not that typical to have a strong math / physics person who is also trained in biology - I would think the medical disciplines that require a lot of math / physics would be very excited to have an summer intern / student to help them out. Thankyou for the wonderful advice. I have looked into interventional radiology before and find it quite interesting. As you said you need to like what you do; I am also interested in commercial/enterprising careers. Do you think business strategy is the realm of the mathamatically inclined? We don't want to get beyond the realm of our expertise. Mathematical expertise is necessary in many different types of businesses - anything that requires a lot of data analysis (like finance, stocks, search engine technology), mathematical modeling - game design, virtual environments, etc, high technology fields - lots of things, we probably know only a drop in the bucket. You might want to check into heavy math Universities like MIT and Cal Tech to see what people go into, also chat up Math Dept professors...but academics often only know a fragment of the real world beyond the University. A bit off the point, I'm wondering what your thoughts are on the reform math curriculums such as Everyday Math -- I feel it does a terrible job of meeting the needs of gifted learners as well as struggling learners. I"d love to know your expert opinions. Don't know if we've done a comprehensive look at the curriculum to offer a full opinion. Some students we've seen have liked it or liked certain aspects of it (like matrices), but we've also heard about problems due to the spiraling of curriculum - some gifted students don't need that repetition, while others with math disabilities find that they are having to shift onto other subjects before they've fully mastered what they're doing at the moment. As a parent my interest is not in trying to find out whether my child has any genetic gifts in the area of math, but to inspire her to enjoy learning. I did not find math particularly fascinating, but recently I have found books and materials that can spark an interest and make math fun. (For example, G is for Googol - A Math Alphabet Book (ages 8+):and How Much is a Million? (Age 4+), both by David M. Schwartz but there are other authors out there) If anyone has any suggestions on making math fun for kids, I would love to read them. Edward Zaccaro, Martin Gardner, Penrose the Cat books are great ones and you might also enjoy browsing the math pages at Hoagiesgifted.org. Math gifted kids also often enjoy strategy and probability games (board games, cards, etc.) There are also math circles and a free newsletter put out by the MAA. There's also the Math Guy and Math Dude. Numb3rs was also a popular show..